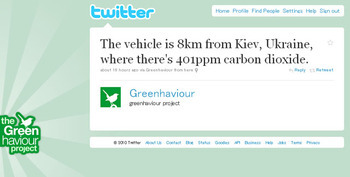 -----image : Twitter - Greenhaviour The vehicle is 8km from Kiev, Ukraine, where there's 401ppm carbon dioxide.
" 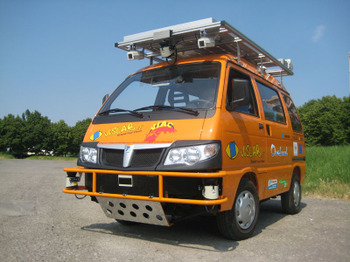 The VisLab Intercontinental Autonomous Challenge (VIAC), an epic 13,000km journey from Parma, Italy to Shanghai, China using unmanned, solar energy powered vehicles, aims to showcase the benefits of green transport. Over the course of the trip, the automated vehicles will use IBM (NYSE: IBM) Human Centric solutions to collect data on CO2 pollutants in the regions covered along the way ? Italy, Slovenia, Croatia, Serbia, Hungary, Ukraine, Russia, Kazakhstan and China ? using the data to assess the health and environmental impact of CO2 in these areas. During the course of the drive, IBM Human Centric Solutions will illustrate the data collecting potential of Smartphones. 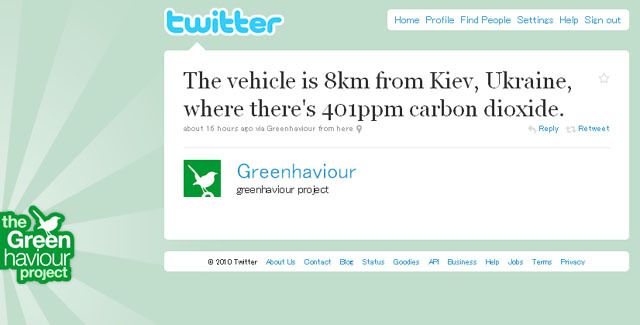 VIAC vehicles will be equipped with specially-designed Smartphones that monitor CO2 levels, providing a live stream of data to the web via twitter, @greenhaviour, throughout the journey.